Take a glance at the Xbox One controller and you’ll notice one key element: It’s strikingly familiar. That’s the goal Microsoft had in mind when it showcased its highly anticipated Xbox One console in May. Not surprisingly, however, the company wasn’t just thinking familiarity. They also opted to add a number of new technological and physical features to enhance the overall user experience. D-Pad: The revamped D-Pad of the Xbox One controller stands out on its own as the cross-shape is no longer attached to a moveable circular platform beneath it. This is something that should provide more precision and control. This especially comes in handy with fighting and sports games where control combinations are sometimes so vital. Thumbsticks: Examine hard and one thing you’ll notice about the Xbox One controller are the slightly altered thumbsticks. Compared to the Xbox 360 controller, the new thumbsticks are now smaller and feature what Microsoft calls a “curled texture.” The Xbox One controller revamp allows the user to move them with 25% less force. This is something that could take a little time getting used to. A, B, X and Y Buttons: In addition to being more tightly spaced, you’ll find that the A, B, X and Y buttons are now placed closer to the Xbox One controller’s surface. 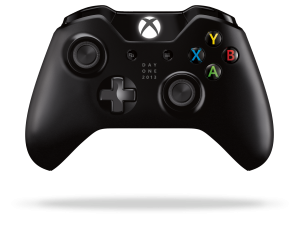 Unlike the old controller, Microsoft has opted for a black background on the buttons. This makes the colored letters stand out better. With this effect, the company is hoping the user’s fingers have a smoother transition as they’re moving to hit the different keys. Triggers: Similar to the thumbsticks, triggers on the Xbox One controller no longer require as much force to operate. This way, you won’t find yourself pulling on them as hard. In addition to that, Microsoft has designed the bumpers to have a natural feel. Battery Cavity: One of the biggest changes to the Xbox One controller is that Microsoft has made the battery cavity internal. It no longer stands out as a big bump on the controller’s underside. Connectivity:In order to provide the controller with a way to connect via Kinect, Microsoft has brought into the mix both reflective technology and LEDs. This allows the device to send out a patterned infrared signal. With this, the company wants to make the controller’s link to Kinect seamless. Player Switching: This is a cool function made possible from the Xbox One controller’s ability to send out infrared signals. Should for example a player physically relocate to the other side of the room while in the process of the game, the console will automatically detect the movement, thus switching that user’s viewpoint in the instance of split screen gameplay. Power:The Xbox One controller has the ability to enter a low power state should the user step away. This lets the controller save battery life. Once the user places their hands back on the controller, it returns to normal operation. Micro USB: The Xbox One controller can operate either wirelessly or plugged in via micro USB. Keeping it plugged in preserves battery life. What’s your opinion on the Xbox One controller? Share your thoughts below.